A cute bug there! Well spotted! Maybe it takes a cute photographer to spot a cute bug. I wondered why it was called a blister beetle, and was surprised to learn how toxic they can be: not only to people, but also to horses and cattle that consume hay in which the beetles have been crushed, releasing their toxin. I found an article in an Arizona newspaper about a woman who’d been bitten by one, and her description of the experience reminded me of my encounter with an asp. Her arm also had what appeared to be several large blisters; the creature seems to be aptly named. The fifth paragraph explains why blister beetles are called what they are. Your encounter with an asp fortunately wasn’t like Cleopatra’s. That was interesting, and more complete than other explanations I read. The fellow certainly does get into his insects — and vice-versa. I haven’t quite had the courage to watch the video attached to this post yet. I don’t blame you for demurring. As the notice on the video warns, once you watch it you can’t unwatch it. I’d have stopped at taking excellent photos of insects, which the guy clearly does. His experiment goes above and beyond any call to duty I’d ever heed. And from New Zealand more unfortunate encounters between human and blister beetle. I am glad you kept your distance from the blister beetle. Who’d have expected two blistering tales in a row? I’m happy not to be a member of that club. 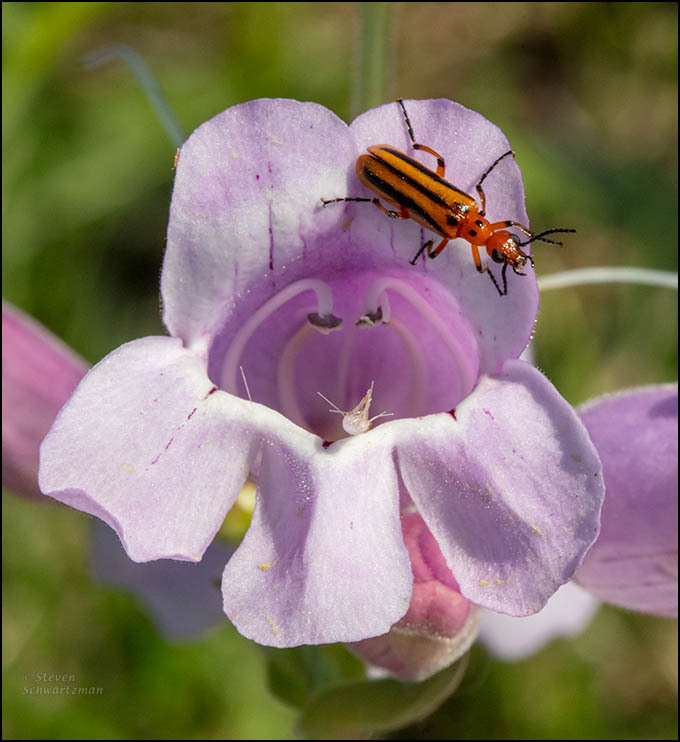 Just as well the blister beetle doesn’t inflict that sort of damage on flowers. Right. Plenty of other beetles already do that. Foxglove? That sounds more appealing than our common name for them. In the Northwest, foxglove are digitalis. Digitalis is an appropriate name for the world of computers. Oh, that made me cringe. The most appropriate name for the so called Silicon Valley is the SANTA CLARA VALLEY. The world of computers needs to be destroyed by Darth Vader’s Death Star! I was just playing with the word digital. I used to have a rotary. That’s a great description, Julie. I’ve seen these guys around, but didn’t know that’s what they were. Thank goodness I’ve never been bitten by one. I’d have to set a blistering pace out of there! It’s apparently not their bite, but a chemical they secrete. Fortunately, none has ever bothered me. When I was a kid I was taught to look but not touch and that has always seemed like sound advice. I’ve often marveled at people who touch and even taste plants they don’t know. Seems to me they’re asking for it.